The Zetas have stated that the Internet will not simple be blocked or taken down in an attempt to restrict the free flow of information. 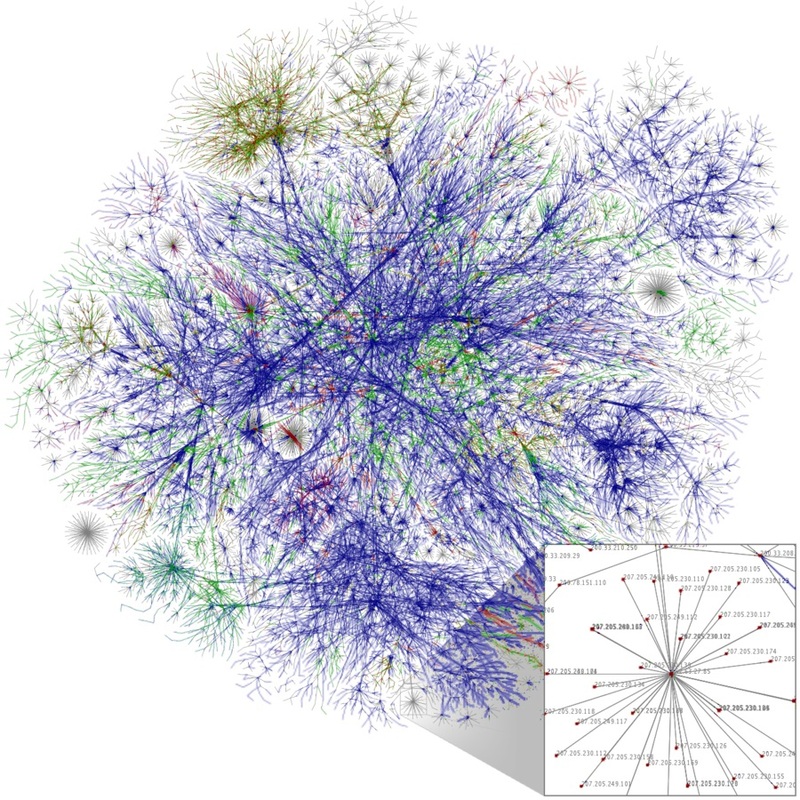 It is used by commerce and government, worldwide, and the design of the Internet is such that blocks are simply bypassed, as this routing path diagram from Wikipedia demonstrates. ZetaTalk Insight 12/8/2012: Due to the nature of the Internet and how it is structured, it is not possible to shut it down globally unless every country were to participate willingly in such a shutdown. We have stated that due to the degree the Internet is used by government and for commerce, the public is hardly the client to be most distressed by an Internet shutdown. The Internet, as designed and functioning worldwide, is like water, flowing around and through any blockages. ZetaTalk Comment 2/12/2011: The Internet was designed to avoid outages by having multiple routes from one point to another. If one server was down, or one city were experiencing earthquakes or electrical outages, traffic would simply be sent on a different route. Thus, if the undersea cables between Europe and N America were severed in the Atlantic, traffic would be routed via Asia and across the Pacific or satellite bounce would be used. This is by design. ZetaTalk Comment 11/10/2012: The Internet functions at the level it does because there are many routes for a packet to travel, so that if one route fails, another is tried. Then the packets are pieced together on the receiving end. The Internet also repeats a send if a packet is damaged or not received. There is a conversation going on where the sending site anticipates a return receipt, and it if does not get it, retries. If there are missing packets at the receiving end, sometimes the whole conversation needs to be re-instituted. 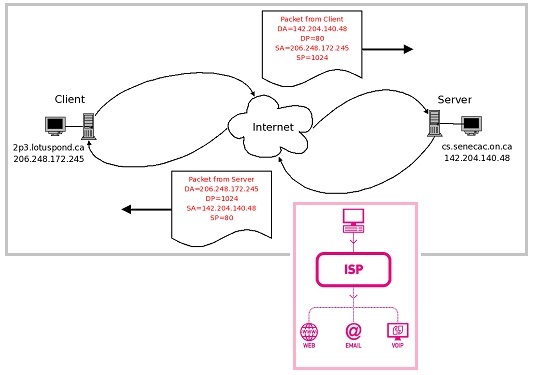 The design of the Internet is based on TCP/IP, with each sender or receiver having a unique Internet Protocol (IP) address and any packet of data moved along by the entire Internet toward its destination. If one route is blocked, another is used, such is the design. IP, TCP and UDP provide the means of keeping distinct the data from each application. TCP/IP is designed to allow many different applications to send and receive data simultaneously using the same Internet Protocol software on a given device. Happy 30th Anniversary, Internet and TCP/IP!!! 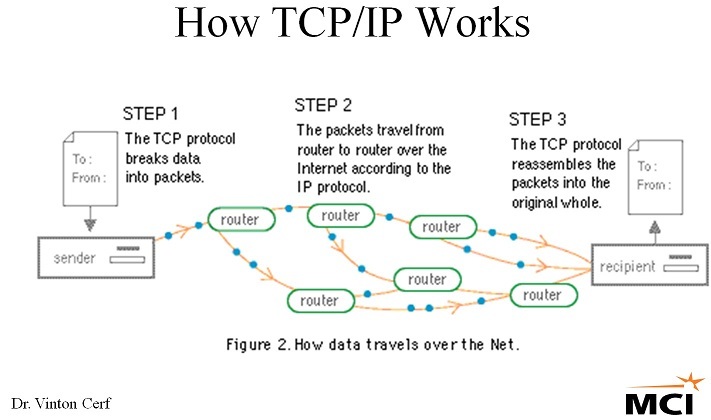 TCP/IP is the protocol that has run the Internet for 30 years. TCP stands for Transmission Control Protocol. IP stands for Internet Protocol. Without an Internet, there would be no World Wide Web, and there would certainly be no Facebook, Google, eBay, AMAZON.com, YouTube.com, CNN.com, etc. In fact, the computer world would probably look like it did prior to the Internet. There are two ways to block the information flow. One is to block at the source, ie take down the website by hacking or crippling it with a flood of requests via a DDOS attack. The second it to cut off users, clients in the public, by disrupting their Internet Service Provider (ISP). Attempts by China or Saudi Arabia to have a single gateway for the country or attempts to shut down the Internet in Egypt or Syria during the Arab Spring failed to block the Internet as the public simply used dialup connections via their cell phones, calling outside the region, or other such bypass techniques. ZetaTalk Comment 2/12/2011: What goes into or out from a particular household or business is a different matter, as this is usually routed through a particular ISP (Internet Service Provider). Thus, if someone wanted to restrict you from the Internet, they could either haul away your PC, or kill your account at your ISP, or close down your ISP completely. ZetaTalk Insight 2/22/2014: What makes the social media aspect of the Internet, in place today, so threatening to a control oriented establishment is the ability to send data as well as merely receive. The reason DDOS attacks are utilized at all against websites and the servers that host them is due to the inherent nature of the Internet as constructed years ago. It was designed to overcome blocks by moving in many different directions. A packet travels with an IP address, and can take an infinite number of routes to deliver the packet to do so. It flows like water. One must eliminate the source, the offending website, to affect the traffic as once out of the door, there is no stopping the packet. The Internet at present is very competitive, with hundreds of service providers available to provide Internet access. Savvy users can even purchase a computer and convert it to a server, becoming one’s own service provider. The public is not excluded from such activity. We have often stated that the Internet will not be shut down, even during rioting that may commence during the 8 of 10 sociological changes, as business and governments use the Internet intensely. But by getting large portions of the public to connect to a controlled gateway, such as Google is offering in cities, one can control those portions of the public. So given the importance of the ISP - the phone number one dials to connect to the Internet such as AOL, the cable provider such as Charter, the satellite provider such as Hughes – what is to be made of the sudden rush to provide free access via wifi in space or balloons in the stratosphere? These technologies will not truly provide Internet access, as they are more akin to getting cable TV, where the flow of information is one way, not interactive. No email. No chats. And a limited selection. This holds the potential for controlled propaganda. An ambitious project known as Outernet is aiming to launch hundreds of miniature satellites into low Earth orbit by June 2015. Each satellite will broadcast the Internet to phones and computers giving billions of people across the globe free online access. Citizens of countries like China and North Korea that have censored online activity could be given free and unrestricted cyberspace. The group is hoping to raise tens of millions of dollars in donations to get the project on the road. Using a technique known as User Datagram Protocol (UDP) multitasking, which is the sharing of data between users on a network, Outernet will beam information to users. Much like how you receive a signal on your television and flick through channels, Outernet will broadcast the Internet to you and allow you to flick through certain websites. The satellites won't be providing conventional Internet right away. They'll initially be used for one-way communication to provide services like emergency updates, news, crop prices, and educational programs. Users will help determine what content is offered. It will be at least five years before Outernet can offer the more interactive Web as we know it, which allows users to both access information and upload it. What is Project Loon? Many of us think of the Internet as a global community. But two-thirds of the world’s population does not yet have Internet access. Project Loon is a network of balloons traveling on the edge of space, designed to connect people in rural and remote areas, help fill coverage gaps, and bring people back online after disasters. 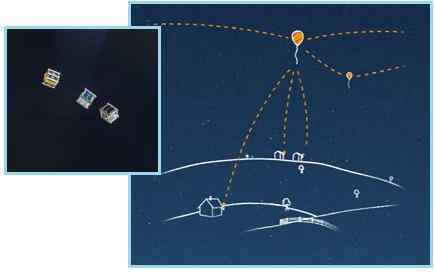 Project Loon balloons float in the stratosphere, twice as high as airplanes and the weather. They are carried around the Earth by winds and they can be steered by rising or descending to an altitude with winds moving in the desired direction. People connect to the balloon network using a special Internet antenna attached to their building. The signal bounces from balloon to balloon, then to the global Internet back on Earth. ZetaTalk Insight 2/22/2014: A sudden rush to provide an Internet gateway could have many motives. It could be humanitarian, wanting to provide the Internet to regions of the world still without access. It could have a profit motive, even if such access is initially given away for free. A demand for traditional land-based ISPs is created, as well as a demand for PCs and phones that can access the Internet. There are also sinister possibilities, as where there are many ISPs serving an area it is not possible to cut off the Internet from the public, but limited gateways allow this type of control by reducing the access options down to one. 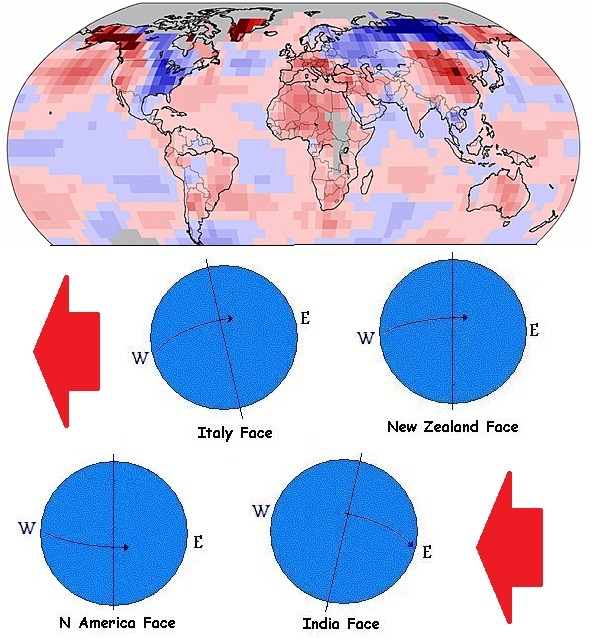 Both sides of the Atlantic are pulled down during the continental rip that occurs during each Pole Shift, which the Zetas have described as a droop on either side of the Atlantic Rift due to lack of support for land masses on either side of the rift. ZetaTalk Prediction 7/15/1995: As we have stated, the Atlantic will widen and the Pacific will shorten. 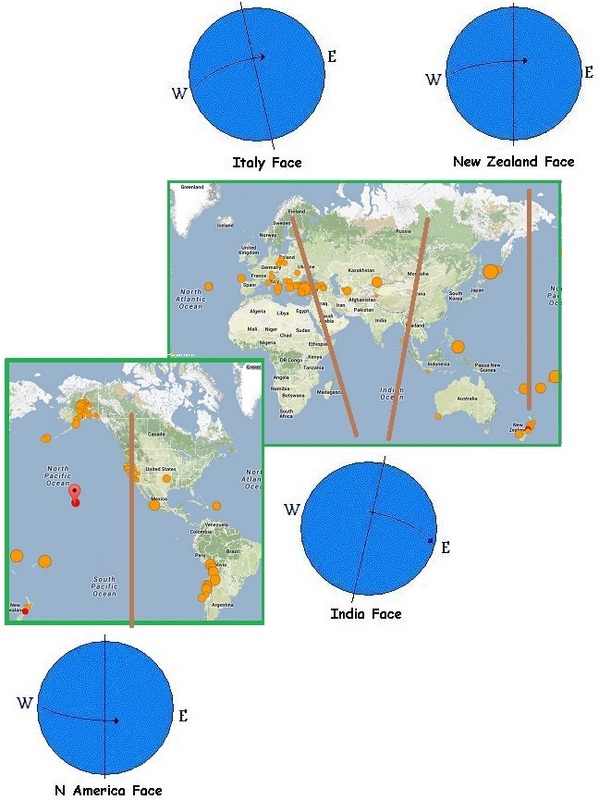 Where the Pacific effect will cause sudden and violent subduction of several plates, which are already subducting, in the Atlantic the effect will be the opposite. A gulf will appear, with plates torn apart and the softer magma under the plates exposed to the cold Atlantic water. Where this will harden the magma, and establish new plate surface, there will be less support for the abridging plates, those that attach however remotely to the shorelines of the Americas, Europe, and Africa. These non-supported plates will sink, somewhat, bringing their formerly above-water land masses down under the water in many places. As an instance, Europe and in particular the western islands of Britain and Ireland will find itself more affected than some other parts of the globe. This fact has hit the news in the UK recently, as this Pole Shift ning blog presents. Evidence of an ancient forest that was pulled under the waves emerge after a storm, and can be seen at low tide. The Guardian even notes this ancient forest is estimated to have gone under the waves some 3,100-4,000 years ago (the passage of Nibiru happens every 3,600 years). 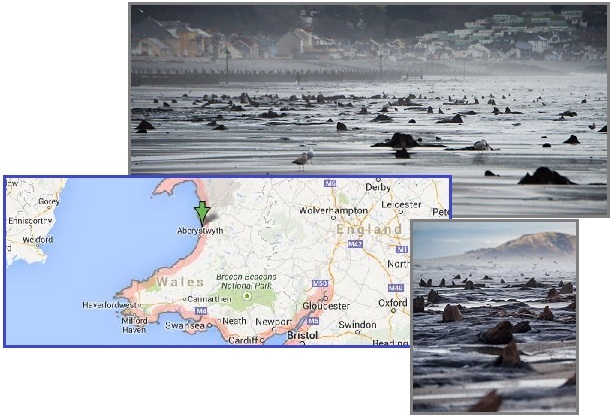 The loss of these lands along the Wales coastline was also captured in a legend. The ancient forest was covered in peat before eventually being swallowed by the sea. Scientists knew the forest was there as stumps could sometimes be seen at low tide. Folklore has it that Cantre’r Gwaelod, or the Sunken Hundred, a once-fertile land and township, was lost beneath the waves in a mythical age. The land is said to have extended 20 miles west of the present Cardigan Bay, but disaster struck and Cantre’r Gwaelod was lost to floods when Mererid, the priestess of a fairy well, apparently neglected her duties and allowed the well to overflow. Archaeologists also found a timber walkway nearby, exposed by the storms. It was made from short lengths of coppiced branches, held in place with upright posts. It has been dated to between 3,100 and 4,000 years old, built as the local people found ways to cope with living in an increasingly waterlogged environment. Human and animal footprints were found preserved in the hardened top layer of peat, along with scatterings of burnt stones from ancient hearths. The issue of the UK being pulled down during each Pole Shift was last covered in Issue 302 of this newsletter where the degree of prior sinkage can be dramatically seen. The Zetas estimate the UK will lose up to 150 feet of elevation in its western lands, due to this draw down during the Pole Shift. ZetaTalk Prediction 8/27/2011: We have predicted the UK in general to anticipate a drop of 75 feet, with Ireland, Scotland and Wales pulled down potentially by 150 feet, as will the East Coast of the US. The land essentially flattens between the East Coast of the US and the islands of the UK, or attempts to do so. This deforming seldom returns to a pre-deforming state, and after the pole shift even less support along the rift edges exists, so the land is also drooping for this reason. Ireland, Scotland, and Wales face the Atlantic Rift more than the east coast of England, and thus take the brunt of the droop. One can see from the underwater shelf that lies to the west of these islands that this has happened before. Across the Atlantic in New Hampshire similar sunken forests can be found. Where the land used to lie, in areas now called the Continental Shelf, can clearly be seen. Here again the estimate in years is given variously as beween 3,500-4,000 years or 3,400-3,800 years. We are speaking of the same event on both sides of the Atlantic. Near Odiorne Point State Park in Rye, this sunken forest is referred to as the "Drowned Forest". The roots of different coniferous trees (including white pine and hemlock) are visible at most low tides. Core samples taken from the roots indicate that the trees are about 3,500 - 4,000 years old. The Jenness Beach forest, much larger than Odiorne Point, is rarely sighted above sea level. The trees, eight to ten feet in circumference, have been carbon dated from 3,400 to 3,800 years old. Some estimates say that the coastline of New England used to extend 75 miles (121 km) east of its current position; a Native American of the era could have walked from Nantucket to southern Cape Cod without touching the Atlantic Ocean. Fishermen have hauled up mastodon and mammoth teeth miles offshore, suggesting that the forest extended quite far from its western shoreline boundary. The spreading Atlantic is also evident in the Caribbean, which was once so much above the waves that one could walk from Florida to Venezuela 10 million years ago, as presented in Issue 179 of this newsletter. 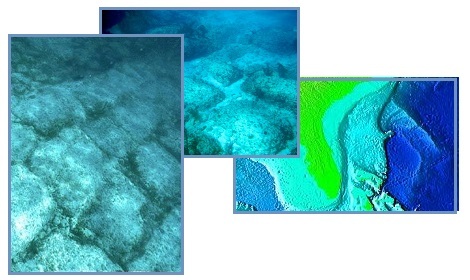 Sunken roads near the Bahamas have been in evidence for years, a favorite of scuba divers, once again dated to approximately 3,500 years ago. Per the Zetas, mankind fears to contemplate cataclysms in their lifetime, so looks away when such evidence presents. But it is clear that the Continental Shelf on both sides of the Atlantic was once land, pulled under during the periodic passage of Planet X. The Bimini Road, also known as the Bimini Wall, is an underwater rock formation off the coast of North Bimini Island, in the Bahamas. The Bimini Road is a fascinating structure and has been a topic of controversial debate for quite some time now. Is this the remains of an ancient civilization or is it a natural formation? The Bimini Road is a 1600 foot long formation of various shaped stone blocks that appear to have been cut, and purposely placed in an arrangement that would serve as a road. The blocks are made up of limestone composed of shell hash that is referred to as beach rock, and radio carbon dating tells us that the Bimini Road roughly is 3500 years old. ZetaTalk Comment 8/27/2011: It is known that land off the East Coast of the US, and in the Caribbean, was once above the waves. The remains of forests can be seen beneath the waves, roads paved with carefully cut stones, and the clear outline of where rivers cut through the previous coastal area. It is clear from the ruins in Central and S America that civilizations existed in the past, and for reasons mankind cannot fathom, disappeared. The reason man struggles with this is that denial is much more comfortable. To imaging cataclysms that could drop the land beneath civilizations is too horrific to contemplate. 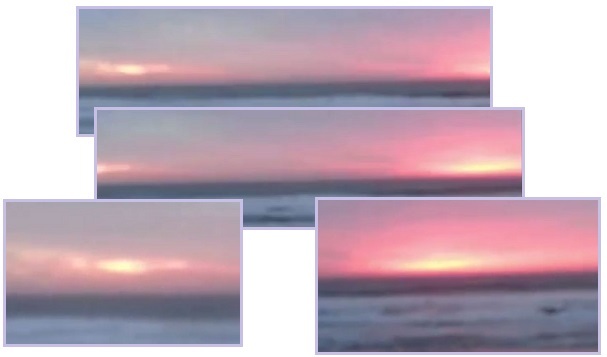 Planet X as a Second Sun seen at sunrise or sunset is increasingly evident and captured on video. The Zetas predicted this increased visibility as part of the 8 of 10 phase, due to the relative location of Planet X vs a vs the Earth. This was last addressed in Issue 358 of this newsletter on August 13, 2013. 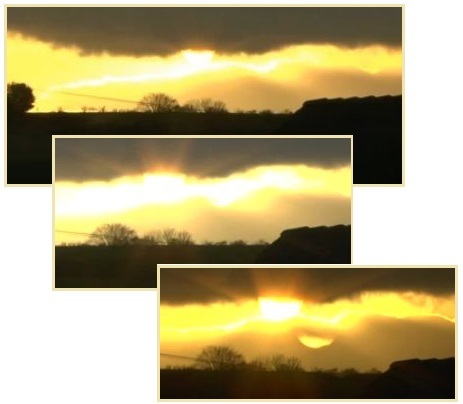 The Second Sun can be seen in Germany on November 13, 2013. In California on February 20, 2014. And in a couple videos from the S Pole’s Neumayer Station on January 21, 2014. One of the videos time stamps the capture. ZetaTalk Analysis 7/20/2013: As we predicted would occur during the 8 of 10 phase, visibility of the Planet X complex has increased. As we have explained, Planet X and the Earth assume a more side-by-side posture during the 8 of 10 phase, Planet X moving forward in its path but the Earth pulling far to the left where it is trapped within the cup. Visibility increases because the angle of bounce for sunlight reflected off the vast dust cloud that shrouds both Planet X and the Moon Swirls is more optimal. The weather wobbles are frequently covered in this newsletter, as the weather gives evidence of the daily Earth wobble. This was last covered in Issue 379 of this newsletter on January 5, 2014 with a graphic showing how the snow cover in December lines up with the Figure 8 wobble pattern. Now, at the close of Winter, Accuweather has provided another image showing the variation this past Winter from average temps during 1981-2010. Note that the wobble has shifted west, to some degree, because Planet X has shifted to the right relative to the Earth, which has shifted to the left in her attempts to evade the hosing of magnetic particles coming from the magnetic N Pole of Planet X. This shift can clearly be seen in the temperature variation map! Steering winds high in the atmosphere, known as the jet stream, have been in a very high amplitude configuration for months. Early in the winter, the pattern developed big southward dip in much of eastern North America and a northward bulge in western North America. Since Dec. 1, 2013, Minneapolis has averaged 8 degrees below normal with Chicago at 7 degrees below normal and Detroit 6.5 degrees colder than average. ZetaTalk Comment 12/21/2013: Weather extremes are due to the Earth wobble, as where there are places of extreme or unusual cold, there are likewise simultaneously places of extreme or unusual heat! While the east coast of the US is experiencing extreme December cold, Alaska is almost in a thaw. And where the Middle East is shocked to be under snow, much of Europe seems to be experiencing an early Spring. The wobble is more violent, swings farther North and South, and parts of the Earth affected by this are getting, thus, more or less sunlight.